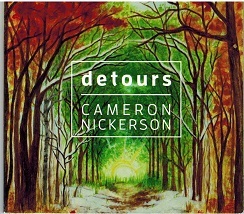 Cameron Nickerson, country singer/songwriter from Yarmouth, Nova Scotia and based in Halifax, released his new CD entitled DETOURS in January 2019 and it has been nominated for an ECMA 2019 for Country Recording of the Year. Nicherson was originally with a band called The Rockabillys and since he has gone solo and moved to Halifax, striking out on his own. The CD was produced by long-time friend and collaborator Blake Johnson (The Stogies) and features gorgeous harmonies by Christine Campbell and fiddle by Calen Kinney. The CD combines Nickerson's love of modern singer-songwriters with the grit and grime of country outlaw heroes like Willie Nelson or Merle Haggard. His songs walks a unique musical path that's strewn with bluegrass, rock and roll, teenage angst, and world-weary contemplation. All songs were written by Cameron Nickerson except OLD MAN written by Alton Nickerson. Cameron Nickerson-Blake Johnson-Larry Hattie-Jamie McDonnell-Calen Kinney and Jason Keddy with Backing vocals by Shaky White-Blake Johnson-Calen Kinney-Christine Campbell-Alton Nickerson -Melissa Comeau. Cameron is on the rise, and we for see more nomination and perhaps awards for this album says Atlantic Seabreeze and gives this album a 5 star rating out of 5 stars on its rating list.p>For more information regarding Cameron and his music, go to his website, address posted above.